Leading Manufacturer of portable air compressor, single stage air compressor, double stage air compressor, piston compressor, reciprocating air compressor and garage air compressor from New Delhi. 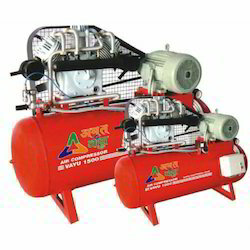 We Amrit Vayu has mastered the art in offering Portable Air Compressor to the clients. This product is manufactured using quality-tested raw material and sophisticated techniques as per set industry standards. Air Compressor is tested on defined quality parameters to assure flawless nature. 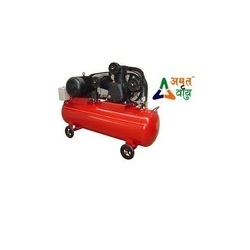 Amrit Vayu offered range of Air Compressor is widely acclaimed amongst customers. Imported piston rings for long life service Intervals. Simple back pressure relief advice for reducing initial torque on the motor. As a noteworthy entity of this domain, we manufacture, supply and trade the premium quality of Single Stage Air Compressor. Available with us at cost effective prices, the offered single stage air compressor is known for its consistent performance, longer serving life and energy efficient design. The offered single stage air compressor is designed by using latest technology. Model No. No. of Cyl. 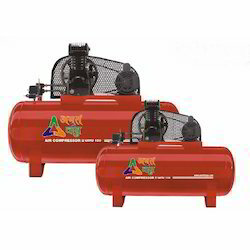 We manufacture and supply Double Stage Air Compressor. Designed by using latest technology, the offered double stage air compressor is known for its consistent performance, thermal stability, less power consumption and compact design. By following total quality management, we assure that the quality of the offered double stage air compressor is always maintained. With vast experience and knowledge we are involved in offering an extensive range of Piston Compressor. These Piston Compressor manufactured using fine quality material under the strict compliance of our experts. The offered products are reckoned amongst the clients for their excellent quality and rust free nature. We offer Amrit Vayu Piston Compressor at feasible prices in market. Reciprocating Air Compressor are positive displacement machines, meaning that they increase the pressure of the air by reducing its volume. This means they are taking in successive volumes of air which is confined within a closed space and elevating this air to a higher pressure. The Amrit Vayu reciprocating air compressor accomplishes this by a piston within a cylinder as the compressing and displacing element. Backed by a team of professionals, Amrit Vayu Equipments Private Limited are presenting our clients a broad array of Garage Air Compressors. 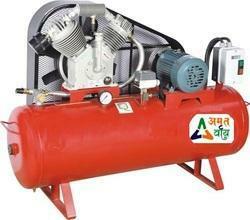 In our product range, we provide Amrit Vayu air compressor units from 0.5 HP to 40 HP high pressure and high volume. 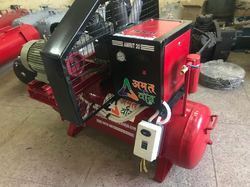 Amrit Vayu Equipments Private Limited are a most trusted name among the topmost companies in this business, indulged in offering excellent quality array of Amrit Vayu Air Compressor to our customers. This Portable Air Compressor is widely appreciated amongst clients for sturdy construction and cost effective nature. Offered products are available at nominal prices. Amrit vayu Air Tank Compressors have very high operating efficiency due to high precision method adopted in production. The cooling efficiency is enhanced due to closely finned cylinder and cylinder head, aided by fan and intercooler. The connecting rod and crank shaft are made out of forged alloy steel. The Unit has splash type lubrication and is equipped with oil level indicator. Air filter is of efficient design and silencer incorporated. The valves are finger plate type for easy flow and are self scavenging. Non-return valves are robust in construction that can be easily dismantled and assembled. Crompton air receivers are hydraulically tested, manholes are provided for easy access for cleaning and maintenance in big size receivers. Tyre inflation & tyre changing m/c. Amrit Vayu Equipments Private Limited remarkable entity, engaged in supplying an excellent range of Single Stage Reciprocating compressors. The reciprocating compressor offered by us is checked before dispatching to customers. Vendor designed this reciprocating compressor by premium grade material under strict direction of experts. This Amrit Vayu Single Stage reciprocating compressor is commended in the industry due to its highly durable in nature & available at competitive rates. Amrit Vayu Equipments Private Limited has achieved widespread recognition for providing Double Stage Reciprocating Compressor to the clients. This product finds use in many industrial applications like fleet maintenance, automotive service, car washes, machine shops etc. Amrit Vayu Double Stage Reciprocating Compressor is manufactured with the aid of advanced technology under the observation of professionals. We are offering Vayu 500 TMD Model Compressor to our clients. 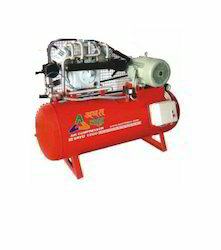 We are one of the leading manufacturers and suppliers of Air Compressor Vayu 1000. We are offering Vayu 750 Air Compressor to our clients. 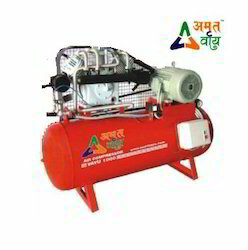 Amrit Vayu Equipments Private Limited is highly rated in providing Industrial Air Compressor to the clients. This product is a widely recognized manufacturer, trader and supplier of Industrial Air Compressor. Offered range is application in high pressure car washes, air conditions, home refrigeration etc. Industrial Air Compressor is A wide range of 1hp Industrial Air Compressor is manufactured in accordance with set quality standards of the domain. This product is widely used for compressing and pressurizing air in fertilizer plants, chemical plants, sewage disposal plants and other allied industries. Amrit Vayu Industrial Air Compressor is provided by compressors are checked thoroughly by good quality checkers on various parameters to ensure their excellent performance. Air Tank Compressors have very high operating efficiency due to high precision method adopted in production. The Unit has splash type lubrication and is equipped with oil level indicator. Air filter is of efficient design and silencer incorporated. The valves are finger plate type for easy flow and are self scavenging. • Tyre inflation & tyre changing m/c.